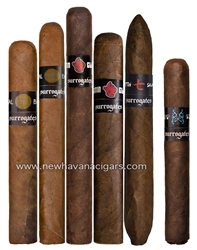 Surrogates 5 and 1 Highly Rated sampler, packaged and sealed with Boveda for Humidified Shipping! Ratings are simply someone else's opinion. That said, we often are swayed to try something based on a recommendation. So we thought we would remind everyone that 3 of the Surrogates projects have scored a '91'. And we thought we would pair that with one of our favorites that received an '87' even though we think it's one worth smoking every day! Decide for yourself with this Buy 5 get 1 Free Sampler!